Formed in 1917, the Regina Pats (originally known as the Patricia, named after a famous Canadian military unit) are the oldest major junior hockey team in the world. Over those 90-plus years the Pats have appeared in 14 Memorial Cup tournaments, winning three Canadian junior hockey titles. Obviously fans in Regina have a tremendous history to celebrate. That is exactly what authors Darrell Davis and Ron "Scoreboard" Johnson are doing with their new book: Junior Hockey's Royal Franchise: The Regina Pats. The book is a complete history of the great franchise, with a well written text honouring the great moments, teams and players over the years. The list of great players who played for the Pats over the years is downright amazing. Clark Gillies, Doug Wickenheiser, Dale Derkatch, Fran Huck, Dennis Sobchuk and more recently Jordan Eberle are the true legends in Regina. In total 145 Pats have made it to the NHL (Murray Balfour, Eddie Litzenberger, Terry Harper, Red Berenson, Derek Morris and Mike Sillinger, for example), as well as several coaches such as Earl Ingarfield, Bryan Murray and, yes, Bill LaForge. While all the greats and NHL grads are given prime coverage, I especially enjoyed learning more the early days of junior hockey, from the formative years right through to the last championship team in 1974. The text is concise and well written, nicely laid out with 260 black and white photos scattered throughout. The award winning book is also in large part a statistical compendium. Johnson has served as the team statistician since 1965 and his wealth of knowledge is all on display. The guy is a living vault of Pats history. His tireless effort has to be be commended. 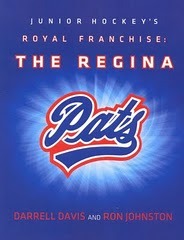 The passion for the Pats of both Johnson and Davis is obvious, which makes this book a joy for all Regina Pats fans. Any long time fan of junior hockey, especially in the west, can appreciate the great effort these two put into Junior Hockey's Royal Franchise: The Regina Pats. The book is listed at Chapters, although inventories currently appear to be low. You can also contact the authors for copies at ReginaPatsHistory.com and ReginaPatsAlumni.com.